Intrahepatic cholangiocarcinoma (ICC) is still a relatively uncommon indication for laparoscopic surgery because of technical challenges related to the frequent need for major hepatectomies and the necessity to perform formal regional lymphadenectomy. The aim of the present case-matched study was to compare laparoscopic and open resections for ICC. In a case-matched retrospective analysis, 20 consecutive patients who had undergone laparoscopic resection for ICC (LPS group) were compared with 60 of 83 patients who had undergone open surgery (open group) in the same institution. The groups were matched in a ratio of 1:3 using propensity scores based on covariates representing relevant patient characteristics and severity of disease. 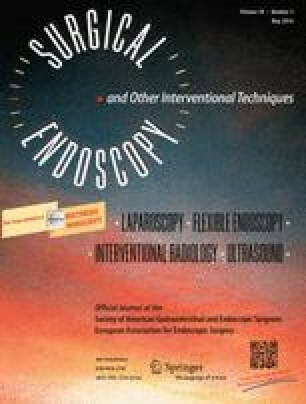 The main endpoints were short- and long-term outcomes and impact and adequacy of laparoscopic lymphadenectomy. The groups were well matched in terms of patient and disease characteristics. The laparoscopic approach resulted in less blood loss (200 vs. 350 mL, p = 0.040) despite less extensive use of the Pringle maneuver. There was no difference in perioperative morbidity and mortality rates; however, the laparoscopic approach was associated with faster functional recovery (median 3 vs. 4 days, p = 0.050). After a mean follow-up of 39 months, disease-free and overall survivals were 33 and 51 months, respectively, for the LPS and 36 and 63, respectively, for the open group (p ns). The number of harvested nodes was comparable between groups. Compared with open surgery, laparoscopic resection of ICC is feasible and safe, providing short-term benefits without negatively affecting oncologic adequacy in terms of rate of R0 resections, depth of margins, and long-term overall and disease-free survivals. Laparoscopic regional lymphadenectomy is technically possible but should be the object of future focused studies. English language revision was made by Edanz Group Global Ltd.
Study design: Ratti, Aldrighetti; acquisition of data: Ariotti, Gagliano; analysis and interpretation: Ratti, Aldrighetti; manuscript drafted by: Ratti, Ariotti; revision: Cipriani, Catena, Paganelli, Gagliano; statistical advice: Paganelli, Catena. The material has not been previously published or submitted elsewhere for publication and will not be sent to another journal until a decision is made concerning publication. All listed authors have participated in the study and have approved the final manuscript. Francesca Ratti, Riccardo Ariotti, Annalisa Gagliano, Federica Cipriani, Michele Paganelli, Marco Catena, and Luca Aldrighetti have no personal conflicts of interest or financial disclosure.